Hi! Welcome to our new webpage and rebranding for 3D Printed Terrain! We are now the company FKA Time Portal Games! From now on attempting to access timeportalgames.com will bring you here. We are expecting to launch our next kickstarter and first installment of out Savage Realms Series in April. 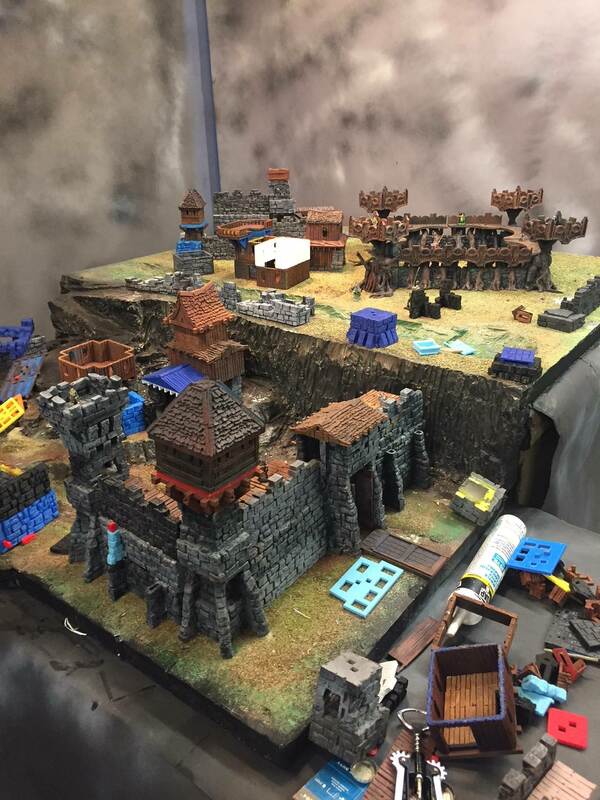 It will Feature the Following amazing 3D Printed Terrain for your D&D, Warhammer, or any other 25mm/ 28mm / 32mm Miniature Game! Snap Assembly. NO GLUE NEEDED! Common build plate size. All models will fit on a 6×9 or 8×8 inch build plate. Open__Peg Build System. Limitless freeform vertical stacking, it can be applied to other designers work too! System is OpenLOCK friendly. NO Supports. Zero support printing, except for a few we put in on a couple of parts. Precision Design: All parts test printed and tweeked no less than three times for both dead-balls-on accuracy and easy assembly. High resolution parts: All resolution and detail is jacked to the nines so your digital files will be timeless as 3D Printing improves. Options for Everyone: Many Parts include both OpenLOCK and Non-OpenLOCK Options. Resin cast products also available! We learned a LOT about production design and casting on our first kickstarter. The Lost Keep will be the payoff for those hard earned lessons! There is a TON of deadly serious next level product design coming at you in our next offering! OpenLOCK and Non-Openlock GIANT exterior walls. The walls are stackable and can reach for “2 to “7 inches in height. The OpenLOCK walls will easily attach to tower built from the official OpenLOCK templates for up to 3 stories. These walls also feature 3 sizes of timber platforms allowing 1.5 to 3.25 inches of space for getting catapults or even giant figures up on your walls and into the battle. Optional Columns on the exterior side of your build walls will allow you to mount gargoyles or other totems to your walls to frighten the enemy! Full functioning gate house with 2 sets of working double doors and a drawbridge. The gate can be broken down to work with a shorter wall and features multiple gate house options for its top, including a functioning oil pour cauldron over the gate! A wide range of wall ruins and rubble piles will allow you to show various stages of wall damage during your battle! Better yet, have your heroes discover a ruined keep and rebuild it as part of your adventure! A modular stacking corner tower system that will allow you to make over 20+ different tower designs. The height of these corner towers can range from 3 inches to 15 inches tall! 3 Basic building Shapes plus 2 more available through stretch goals. Each building comes in 3 different simulated materials! High Resolution Timber, Rough Cut Timber, and Stone. No Glue snap together windows and doors. The doors will be functional and there will be a window option for Plexiglas inserts. Many more window Options to open with stretch goals! Bool tools will be included so you can cut in your own windows or doors. Special Foundation Designs that will allow for many variations at lower levels. 4 basic roof designs and many smaller or specific use roof designs, plus more through stretch goals. A Complete Blacksmith Design, and more available through stretch goals! A full castle OpenLOCK set to build a ruined castle and wall towers. Fully rebuilt castle available through stretch goals! Full OpenLOCK Elf outpost with corner towers and gate. This is a sneak peak offer into our next Kickstarter “Elven Forests and Goblin Caverns”! Alternate Corner designs, Curved Walls, and Elven Stronghold available through stretch goals! Did we mention glue free assembly and support free printing!?! ?